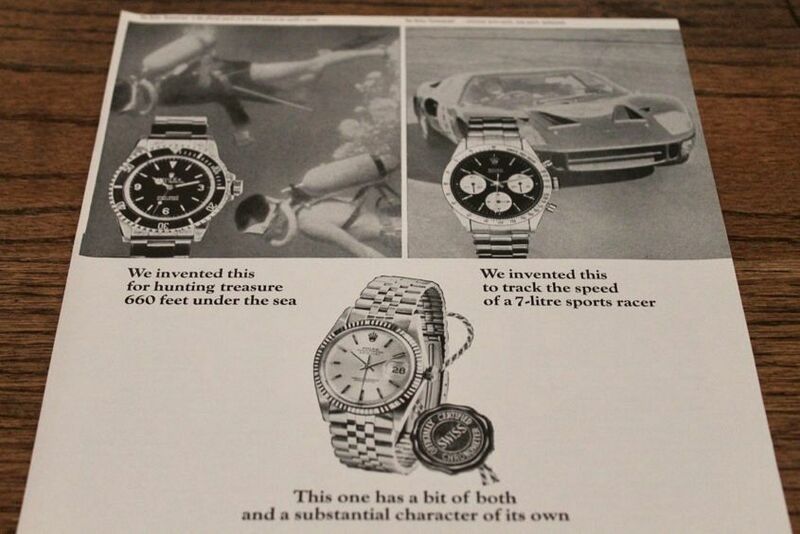 So, how did you get into vintage watch ads? 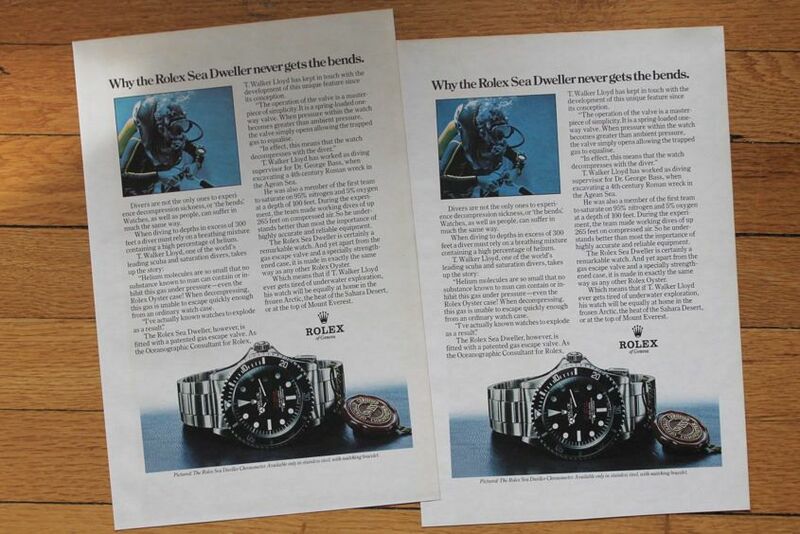 Ah, it all started when I was a teenager in the mid ’90s … I remember taping Rolex ads to my bedroom wall. The ads weren’t vintage, and, oddly, most of the models advertised weren’t ones I wanted to own. They were just random Rolex ads (I even had Lady Datejust ads pinned up). It was less about the actual watch, more about the brand. You see, I aspired to own a Rolex, and having these ads greet me as I entered my room — looming over my head as I did homework, the last thing I saw before falling asleep — served as a reminder and motivation to get good grades, work hard, stay out of trouble, so one day I’d be in a position to get one. As far as getting into vintage ads … I only began to hunt (collect) them a couple of years ago. I never set out with the intention to sell them. At first, I was drawn to the challenge of finding them, especially iconic ads for coveted, big sport models. Over the years I’d seen images of vintage ads on the internet (in books, too) and wanted to try to find those actual ads. It was (and still is) a thrilling feeling to discover a magazine issue with a legendary ad inside. We all agree that collecting actual vintage watches has become harder and harder (and more and more expensive). 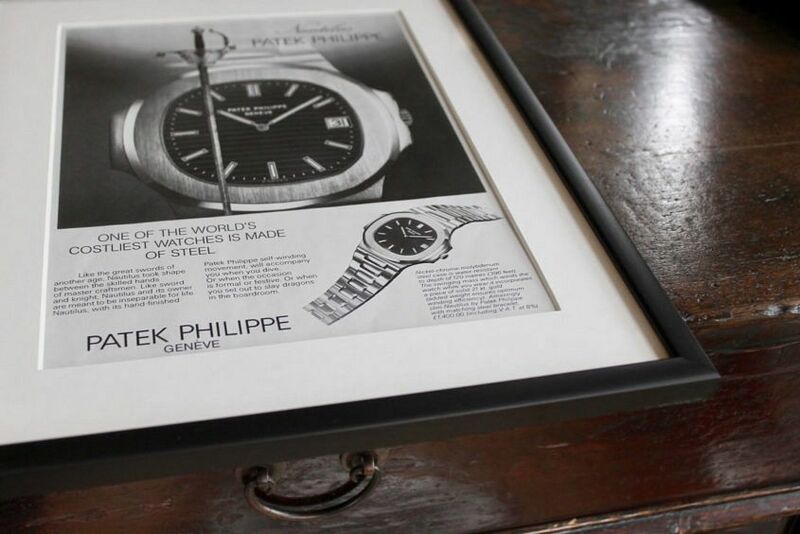 For me, finding an old, rare ad is as gratifying as coming across an original-owner watch. It took a lot of convincing from my closest friends in the watch community to launch Ad Patina. Part of my reluctance to start a business around ads was not wanting to let go of hard-to-find ones. I guess I’ve come full circle … 20-plus years later I’m reliving a part of my childhood. Watch ads were a big part of me getting hooked on watches. It feels nice to reconnect with this period of my life through ad collecting/selling. 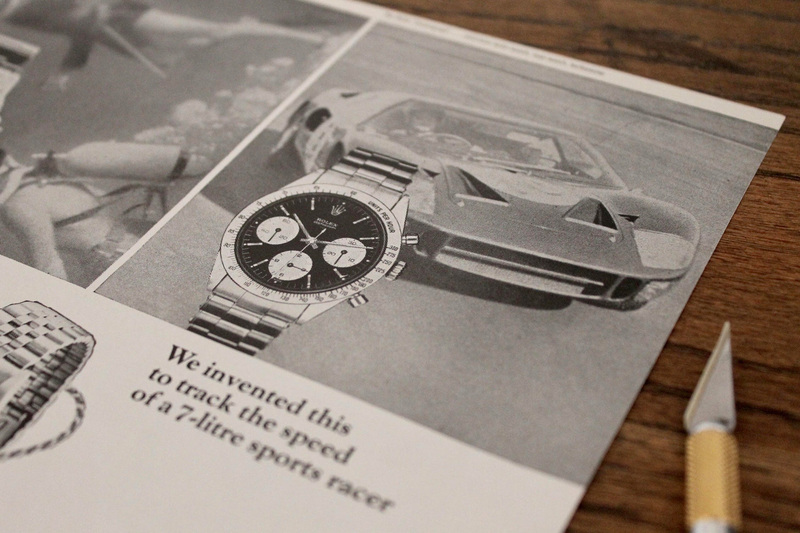 I’m glad others see something in these ads, too — whether inspiration or simply something to go with their watch. What makes a great watch advertisement? I’ve actually never thought about this … and let me say, it’s a deep question. Just like we all have favourite watches (for various reasons), the same is true for ads. The phrase, “beauty is in the eye of the beholder” can be applied here. For example, I really like vintage Rolex Explorer IIs, so all ads for that model are “great” to me. But I won’t skirt the question. I will say there are some ads whose greatness cannot be denied. The ads I’m speaking of are really any for the earliest known references of a model. Some of the ads I’ve singled out here as my favourites are perfect examples. 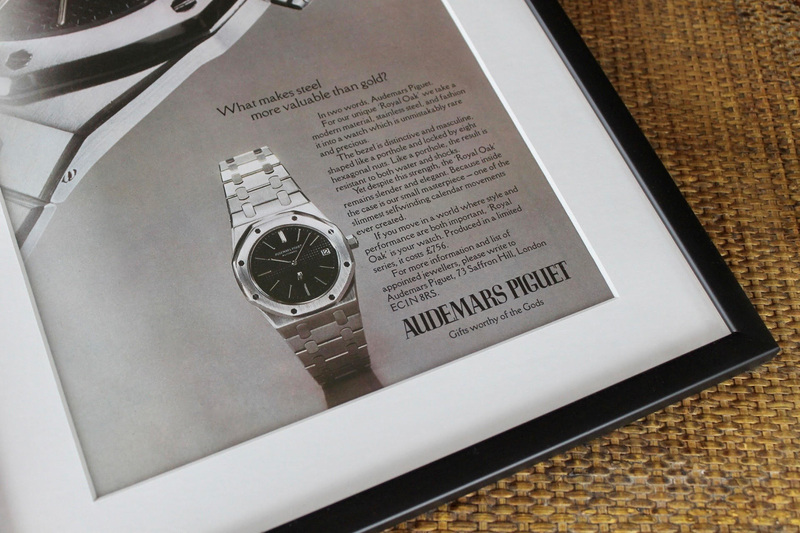 I think everyone agrees the 1975 Royal Oak and 1977 Nautilus ads are pretty special, right? They really have it all: incredible detail of the watches (in the case of the Nautilus ad, beautiful artwork rendering) and overall they possess a certain charm and innocence. If you read the slogans, the full copy, and notice those prices … these ads represent a time that ceases to exist — that we all wish we had a time machine to travel back to. 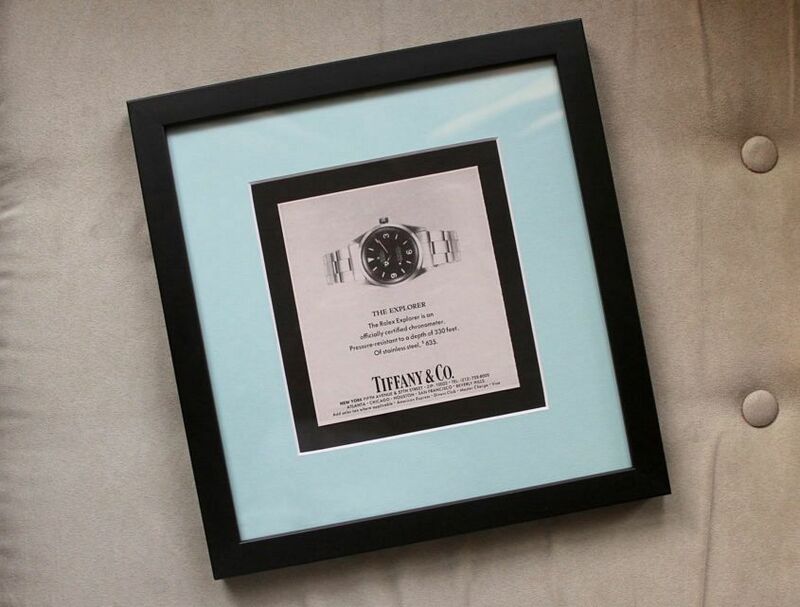 Finally, I think ads for unique watches, like a “Tiffany & Co.” branded Explorer are pretty great. And I still have a hard time letting go of hard-to-find ads, so any rare ad is “great”. Also, 1960s ads in colour really stand out. Is there a golden age of watch advertising? Let me say, there are killer ads from all decades. But I’d have to say the very-late 1950s through 1960s. It’s no coincidence this timeframe coincides with what I consider (as do many others) to be the golden age of sport watches. When the models we go crazy for today (and pay crazy sums for) were being introduced. Whenever I hold these ads, I can’t help but imagine myself alive back then and in a position to buy, say, an original GMT-Master or the very-first Speedmaster. How do you source ads? Any tricks of the trade you can share? Good try, Felix! But the secret recipe is staying under lock and key. What’s the holy grail of vintage watch ads? There’s so many incredible ads I know exist, but I’ve yet to come across … This is what keeps me passionate about my ad business — the detective work involved and thrill of the hunt (and knowing so many others share my love and fascination for them). Off the top of my head, I need to have all the vintage Daytona ads — they’re some of the hardest to track down … Unless I was able to find duplicates, I probably wouldn’t sell them. Finally, pricing. What are we looking at for a vintage watch ad? Well, it’s same as vintage watches, older, rarer, and more desirable watches tend to attract a premium. But mostly they’re priced between$45 and $85 (USD), with some going for $150 plus. Personally, this is the most beautiful watch ad ever. One day, when I get around to framing an ad for myself, this will be the first I frame up. It’s the best-selling ad by a long shot — it never disappoints. It really needs to be seen in person to be truly appreciated. The imagery is outstanding — it could be on display in a modern photography museum. The slogan could be Rolex’s mission. Basically, tough watches you can count on. Oh, and the watch … the famous, Everest-conquering Explorer — not a bad choice! I mean, really, the first Speedy ad … doesn’t get much better than this, whether you’re a Speedy guy or not. This ad is truly Pre-Moon (see guy in sports car, not in a spaceship). No mention of NASA here — just a tool watch for timing distance and calculating speed, hence “Speedmaster”. 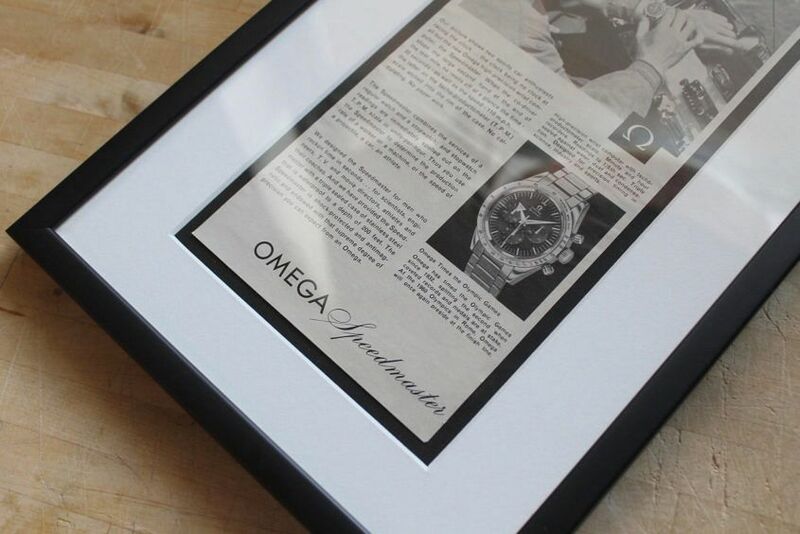 Back then, I don’t think Omega ever envisioned the success of the Speedmaster line when they debuted it. Within a decade it became the go-to watch for astronauts. Now it’s a “must-have” in every collection. Ads like this give me the chills. To think people flipped a page in a magazine, saw this ad, and probably kept perusing the issue … I’d like to think that if I came upon this ad I’d run to the nearest jeweller and buy up every Royal Oak. But that’s hindsight talking. And that’s what’s remarkable about this ad. The watch was such a departure in design from what people were used to. The ad is great, not only because you get not one but two images of the Ref. 5402 in full colour, but because it captures a vision, a design, that has transcended time. Simply a stunner to behold. There’s no denying Patek’s place in wristwatch history. And perhaps the watch they’re best known for is the Nautilus. It’s safe to say that today the Nautilus is the brand’s strongest-selling, most-demanded model. But when this ad came out, people needed to be sold on it. After all, it was a steel watch that cost as much (if not more) than a solid gold watch. Everyone wants one today, but it took a discerning individual to purchase one 40 years ago. 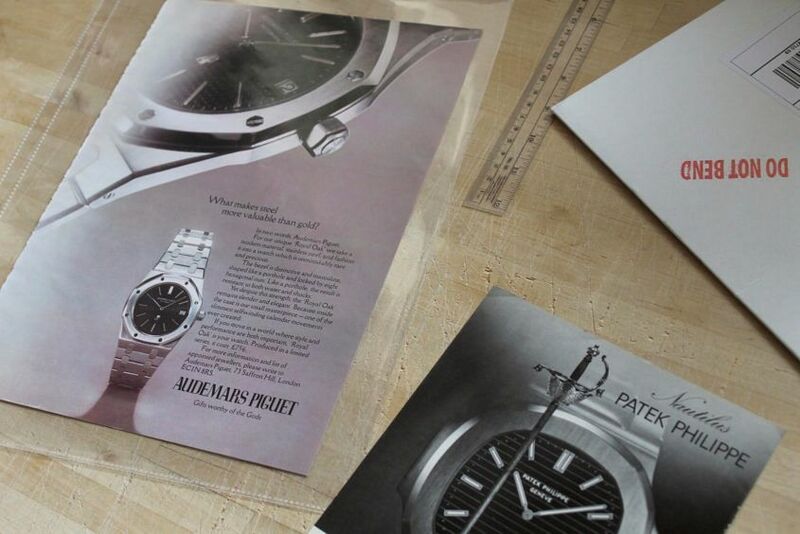 We all agree Patek’s ads have a different air about them today … This is a refreshing ad from an era when luxury was truly luxury. “Double Red” Sea-Dweller ads are really hard to find. Most were published in very obscure industry journals. This one came from a library reference book and the print/photo quality is second to none. 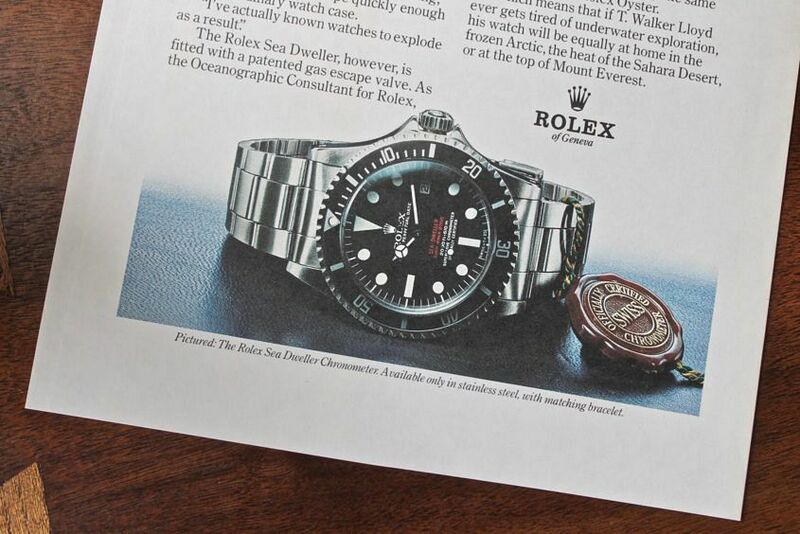 Besides being an extremely rare ad for a highly sought after sport model, it’s also great because the format is an example of a classic Rolex marketing layout used through to the ’90s: long-form copy that tells a story, including a testimonial from a professional as well as information about the watch — all wrapped around thumbnail images. 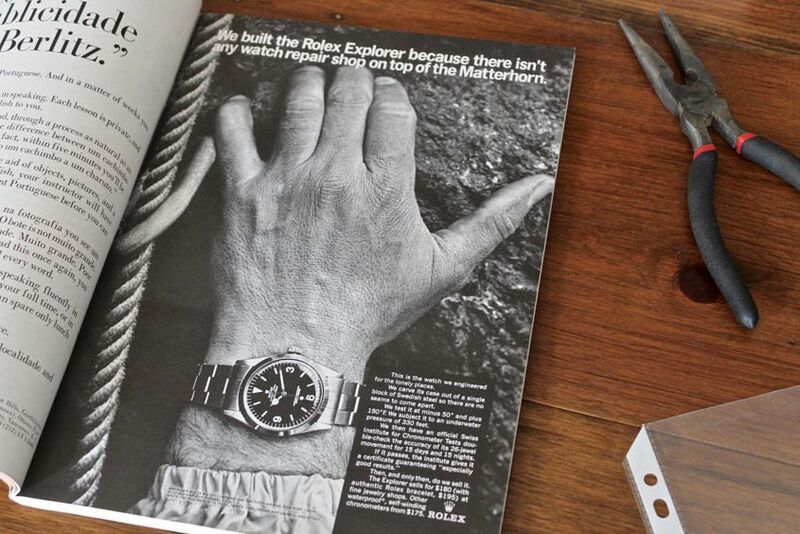 When I set out to find old Rolex ads, this was my grail. It’s a Daytona ad, after all … Not long into my hunting, I managed to track it down, figure out what magazine it was in. Scoring this ad was an incredible feeling and played a big part in my unearthing more ads. Besides the sentimentality I have for it, it’s a great ad in its own right. It features the first version of what would become known as the Rolex Daytona — underline dial and all. I also think it’s pretty cool that it also advertises two other iconic Rolex watches: The Submariner and Datejust (prominently showcased). Goes to show you what model was popular back then … my, have times changed.